During Friday morning I attended at the Salisbury West Library at the invitation of Katherine Hajdu. I must say I was surprised by the number of local people and others from outside the area who attended the venue at such an early hour. I presented details relevant to why I wrote and published my book, outlined many of the problems associated with it and gave reasons why I excluded specific material. I gave a lengthy overview of the police investigation and my personal involvement to clarify a number of issues. At the completion of the presentation I received many questions relevant to the subject. I also enjoyed a number of meaningful discussions with various members of the audience during the morning tea. During the afternoon of Thursday I gave a presentation hosted by Friends of Seaford Library in that facility. The presentation covered the police investigation of The Unknown Man since 1948 and my involvement in more recent years. I outlined my interest in the subject and why this led me to eventually write and publish a book. The afternoon concluded with a large number of questions relating to various topics relevant to the subject. Trish Jamieson arranged and hosted the enjoyable afternoon. Postal costs are continually rising and although postage to the USA and Canada was cheaper than Europe and other overseas countries it has now increased a further A$9.00 (Surcharge) to A$33.00. This cost is now comparable to postage rates throughout the world. For your information it costs me A$1.30 for a padded envelope plus the postage making a total of A$34.30. For some time I have been subsidising these costs to varying degrees and future postage and packaging to all overseas countries will therefore be a uniform $A25.00. I have been advised that the rise in postage fees has been caused by the requirement that all overseas packages must be x-rayed. Postage within Australia will remain at $7.00. During 2011, Marymount College, Hove, decided to use the factual subject of the 'Unknown Man' for Year 11 students to access the various facilities to enable them to research history. I visited the college on numerous occasions and supplied facts and opinions relating to the subject, answered many comprehensive questions and participated in a number of final group presentations. I was very impressed by the enthusiasm of the students towards the subject, and the many comprehensive and varied final presentations reflected on their ability to research a complex subject. On Tuesday evening, 8 November, I attended a Felixtowe & District Neighbourhood Watch meeting as a guest speaker, where I gave a presentation on the subject of the 'Unknown Man'. I was very pleased to have the opportunity to make the presentation to a large attentive audience. I recently participated in a radio interview with Peter Goers on the ABC. Peter also included the following Goers' Verdict under the title 'Hot' in his regular Sunday Mail article on 8 May 2011; "GERRY FELTUS's book The Unknown Man ï¿½ the definitive account of the mystery body at Somerton Beach in 1948." Trent Chaplin (artist) and Andrew King (photographer) will be presenting an exhibition of paintings and photographs at the Bay Discovery Centre within the Glenelg Town Hall. 'The Body on the Beach' - the subject of the exhibition and will be displayed as part of History Month. The author who met with Trent and Andrew was given a 'sneak' preview of their portrayal of a subject that has captured and retained interest for many years. The paintings, photographs and presentation of their interpretation of the story were both interesting and professional. A worthwhile visit will be in store for those interested in the subject. The book 'The Unknown Man' will be on display along with a list of locations where the book can be purchased. The author was pleased to be invited to participate in a recent interview with Peter Goers on his evening radio program. An interesting discussion about the background of the author and the subject of the book was elicited by Goers. It was also an opportunity to promote the reprint of the book and nominate the outlets where it can be purchased. A much appreciated article was printed in the Community Section of the West Coast Sentinel in relation to the author and his self published book. The article nominated outlets where the reprinted book can be purchased and made reference to the web site where a full list is maintained. An article promoting my book and nominating some of the book outlets where it can be purchased was printed in the April 2011 edition of 'Blue & Blue' and published by the Sacred Heart Old Collegians Association. My thanks to Jane Ping. The books will be delivered to these outlets on Monday 28 March 2011 and they should be available shortly thereafter. I will maintain my postal & online sales to overseas, interstate & intrastate clients via the website or through other arrangements. For an updated list of outlets stocking the book, please refer to the Bookshop Sales Page. On Wednesday 23 February 2011 the Guardian Messenger published further publicity in relation to the Book and subject matters for which I am grateful. As a result I sold all my available copies of the book and I had to negotiate a reprint to satisfy pending orders. Positive responses have been received from a number of sources who have read the book, including overseas purchasers. All of the responses made complimentary references to the cover, structure and content. To date sales have been very good with orders from the USA, UK, Germany, SA, WA, QLD, NSW, ACT and VIC. Luckily no books have been lost in transit and apart from a couple of minor postal hitches the deliveries have been prompt. The majority of sales have been obtained through this web site via CreditCard/PayPal and the private P.O. Box facilities. A number of interested parties have inquired through the email contact theauthor@theunknownman.com to seek the location of other outlets. Unfortunately, due to costs associated with self publishing it is not a viable proposition to sell the book through established venues. The minimum cost of packing and posting a single book in Australia is $7. Ironically up to six books can be posted in a larger 'Prepaid satchel' (in Australia) for a cost of $10. Wherever costs can be reduced, reimbursement of the difference has been refunded to clients. Also, if upon receipt of orders it can be established that the delivery point is in close proximity to or along a route often traversed by the author, he will offer to deliver the book/s personally and make a refund. On Wednesday 1st of December from 2pm to 4pm the author attended at the Holdfast Bay Library, Glenelg with copies of his book for purchase and signing. As it happens, this day was the anniversary of the death of The Unknown Man. The promotion was successful and provided an opportunity to meet many readers interested in the subject. I am grateful to the library management for the use of the facilities and the assistance of the friendly staff. On the morning of Wednesday 1st of December an article written by Alice Monfries was produced in the Guardian Messenger and delivered in the seaside suburbs of Adelaide. The comprehensive article related to The Unknown Man and promoted the forthcoming attendance at the Glenelg Library, the book and the web site. The promotion was appreciated and a number of attendees made reference to the article prompting them to attend. As a result of an invitation from Monique Bowley the author attended the studio of 5AA on Tuesday 30th of November and participated in a talk segment with Amanda Blair. I was grateful to have the opportunity to promote the pending visit to the Glenelg Library, the book and the web site. A number of people who later attended at the library made reference to hearing the broadcast on 5AA. On Sunday 21st of November an article written by Nigel Hunt was produced in the Sunday Mail that promoted details of my recent publishing of a book titled The Unknown Man. This article generated considerable interest in the book locally, and captured country responses state-wide. The ability of the Sunday mail to capture such a wide audience was greatly appreciated. The book launch was a complete success, thanks to all who attended. We have added a couple of pictures from the launch to the photos page. Click Here to have a look. 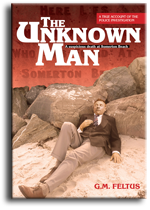 On Saturday 13th November 2010 between the hours of 2pm and 4pm Gerald (Gerry) Feltus will be launching his book 'The Unknown Man' - a suspicious death at Somerton Beach. To be launched by Ross James MD BS FRCPA. The venue is the SA Writers' Centre, level 2, 187 Rundle Street, (old Malcolm Reid Building). Access to lifts can be gained through 'Caffe Brunelle' just west of the Rundle Street entrance or via the rear entrance from York Street. York Street also provides direct access to a large car park (above Hungry Jack's). All of the people who have had some previous involvement in the subject will be in attendance and the original plaster cast of the Unknown Man will be on display. Light refreshments will be provided. All welcome. Come meet the author.